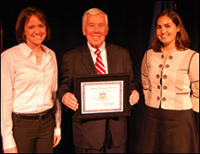 GreeND, a University of Notre Dame student organization focused on energy and environmental issues, received an Energy Patriot award from Sen. Richard G. Lugar, R-Ind., who spoke on campus and toured the Universitys Energy Center on Oct. 8. The Energy Patriot award honors a student, professional, scholar or member of the business community who has demonstrated leadership and initiative in taking concrete action to improve Americas energy security. GreeND co-founders Lourdes Long and Colleen Kelly began a recycling program at Notre Dame football games that, in a single game, collected more than 16 tons of recyclables, which otherwise would have ended up in a landfill.The group also recently distributed 1,400 new energy efficient light bulbs to students in residence halls and successfully collected the same number of old bulbs. What started as a group of about 10 students has developed into a solid interest base of 150 students and more than 800 subscriptions to our e-mail publicationLong said.Energy issues are so critical.Ensuring each residence hall has a sustainability commissioner is another way we are reaching out to students to show how comfortable a sustainable lifestyle can be. GreeND leaders direct seven committees: Recyclin Irish, Energy Club, Energy and Environmental Policy Club, Campus Action, Energy Conservation Corps, Sustainability Commissioners and a task force of related student groups.The club collaborates with the administrations Energy and Environmental Issues Committee, the Energy Center, Students for Environmental Action and the University Affairs Committee of Student Government. Solving our energy crisis for future generations requires a nation of leadersleaders in government, industry, science and leaders in our great universities,Lugar said.I am honored to recognize the achievements of this group of leaders at Notre Dame. Energy security is one of Lugars top priorities, and he has proposed a variety of bills to encourage the use of alternative fuels, to promote energy efficiency, and to strengthen the bonds of energy cooperation between the United States and other countries. For additional information on GreeND, visit http://gogreen.nd.edu/.To learn more about energy research at Notre Dame, visit http://energycenter.nd.edu. Originally published by Shannon Chapla at news.nd.edu on October 15, 2008.